The fun never ends, and neither do the shows. At the end of this month, Rehs Contemporary Galleries will be exhibiting at the Affordable Art Fair in New York City. A private preview will take place on March 30th from 6 – 9 pm and then the show opens to the general public on March 31st and runs through April 3rd. On Friday, April 1, there is free admission from 6 – 8 pm. This is an excellent opportunity for both seasoned and young collectors to acquire some ‘affordable’ art since all of the pieces on display must be priced under $10,000 and half of each exhibitor’s booth must contain works under $5,000. This year we will be on the second floor and are scheduled to exhibit exciting works by Anthony Mastromatteo, Todd Casey, Ken Salaz, Mark Daly, James Hollingsworth, Tony South, Dave Palumbo, Julie Bell, Chris Pousette-Dart, Tim Jahn, Ed Dillon, Anthony Waichulis and a selection of other works by the Ani Art Academies artists. For more information, please see our Upcoming Exhibitions page. I am pleased to report that I did not turn on the financial channels this month … so no BS as to why the market was going up, down or sideways; that was real nice! I am also betting that you ‘gold guys/gals’ have a smile on your face -- it is over $1,239 (closed out January at $1,118). Oil still seems to be the big issue with a month low of $26.19 and a high of $32.74 (which it hit on the last day) … so it lost a little ground from last month’s closing. As for the currency markets … if you are planning a trip to Great Britain or the Continent you better get going. The Euro is at $1.08 and the British Pound hit the $1.40 range (wow)! As for the all important stock market; well, we opened the month at 16,453, got down to 15,660 by the 11th and closed out at 16,516 … all in all, not too bad. I did not look at my portfolio all month (we were away for most of it selling paintings) … just checked it on the last day of February so I could write this (so these numbers are a few days old): JP Morgan ($56.30 – down 4.35%), Exxon ($80.15 – up 5.06%), GE ($29.14 – up 1.75% ), AT&T ($36.95 – up 2.13%), Verizon ($50.73 – down 0.06%), Wal-Mart ($66.34 – down 1.72%), Coke ($43.17 – up 0.30%), DuPont ($60.87 – up 14.20%), Merck ($50.21 – down 1.06%), Disney ($95.52 – up 0.39%), Citi ($38.85– down 8.55%), Intel ($29.59 – down 3.99%) and Bristol-Myers ($61.93 – up 1.83%). I will add that we have now sold our Citi (at a nice loss) and bought Apple. I’ll be the first to admit – when it comes to buying art, it gets addicting. We often find ourselves opening up a new shipment of paintings from one of our very talented contemporary artists and saying, “That would look great in my (insert: room in the apartment/house),” or after acquiring a beautiful 19th/20th century piece thinking, “I PROBABLY can still pay my rent/mortgage if I buy that…maybe a payment plan would help…maybe not....” Anyway, the following articles I found have less to do with the addiction to art and more to do with art camouflaging the importation and sale of drugs. Wonder if some would be classified as ‘performance art’? News of the largest drug bust of liquid methamphetamine in Australia hit the airwaves (or should I say the Internet). According to reports, $1 billion worth of the drug was seized after Border Force officials opened a container shipped by a “high risk” individual from Hong Kong. Inside the crate were 86 boxes of gel push-up bra inserts filled with 190 liters of liquid methamphetamine. Following the investigation, police allegedly uncovered another 530 liters of the drug concealed inside art supplies such as children paint-by-number kits along with two kilograms of crystal methamphetamine. Since the find, four individuals have been charged in connection to the manufacturing and distribution of the drugs. $1 million worth of marijuana was seized in the West Village, NYC, last week. Patrick Johnson, 46, Christopher Bender and Matthew Parrigo, both 27, have been charged with criminal drug possession in the first degree after NYPD received a tip to investigate the three men unloading large crates, in broad daylight, marked “ART” on Bleecker St. With the assistance of a drug sniffing k-9, cops uncovered 300 pounds of marijuana. Since we have been travelling so much, I plan on keeping this month’s REALLY section short and sweet. Ok, I know I said I wasn’t going to report on automobile sales anymore, but this car sale caught my eye and since there is nothing to compare it to, I thought I would take my chances. The Fiat 500L that Pope Francis used when he visited the United States last year recently sold for $82,000 … crushing its $30,000 estimate! The proceeds will go to the Children’s Hospital of Philadelphia, as well as several other Catholic charities. Remarkably, the Pope’s appearance in this tiny car ignited Fiat’s sales in the United States, increasing them by about 35% - Really? A medieval ring worn by Joan of Arc shattered its presale estimate of $19,500 when it hammered down at $411,832! Specialists are confident that the ring belonged to Joan of Arc, (given to her by her parents) as the description matches the court transcripts from her trial. Joan of Arc was supposedly wearing the ring when she received a vision from God to fight beside King Charles VII in the Hundred Years War. In May 1430, Joan was captured by the British, tried, and then burned at the stake. It is believed that the ring was passed down through the family of Cardinal Henry Beaumont, an English priest at the execution…Really? The good news is that the archives will stay in America and fully intact, which was Really important to the Puzo family. As you all know by now, we participate in numerous art or art/antique shows during the year. This is not something new in our industry, we started showing over 30 years ago; however today these shows have become more of the norm. Thirty years ago a gallery like ours might have participated in one or two during the year, now it is not uncommon for galleries to participate in 6 or more. In the first two months of 2016 our gallery has already participated in 3: Los Angeles, Palm Beach and Naples. In addition, we will be exhibiting in the Affordable Art Fair this month … so by the end of the first quarter we will have finished 4 shows. I know that some of you have followed the posts on our blog, Facebook and Instagram showing the before, during and after images of our booth; so I thought it might be nice to give our readers a behind the scene description of what goes into creating a successful booth. First, there is the decision as to which shows to hopefully participate in (there are hundreds). I say hopefully, because there is an application process and not everyone gets into the show/shows they want. Then one has to be ready for the shock of what a booth can cost … some will run just a few thousand dollars while others can reach the 6 figures. Then there are flights, hotel, car and trucking reservations (remember the artwork needs to be transported back and forth as well). After the basic financials are out of the way you start designing the booth. A 20 x 24 foot booth is just that … 20 x 24 feet of perimeter walls with a basic lighting plan. Any interior walls, closets, lights, shelves, etc. need to be placed on the floor plan and submitted to the show company for approval and cost. Yes, in most shows additional walls, lights, power, etc. are extra. Once all of that is out of the way you can relax until about 10 days before show time when the works to be displayed are chosen and arranged to fit the floor plan. After we have a general idea of the layout we begin packing. Since we do not crate each work, this probably sounds more laborious than it actually is. We use commercial bins which can hold between 8 and 18 works … depending on size … while the very small paintings are placed in storage bins which can hold as many as 30 works. For the Los Angeles Art Show, we sent more than 140 pieces (about 8 commercial bins and a couple of storage bins) … and let’s not forget the tool box (which is pretty large), ladders, luggage (yes, we send a majority of our clothing), tables, chairs and for some shows we need to bring and install our own lighting (track, fixtures and bulbs). Two or three days before the show opens we arrive at the location. The first thing is to double check the layout; sometimes changes need to be made before we can begin the set-up process (walls in the wrong place, problems with the wall surface, electrical problems, etc.). Once everything is perfect we start unpacking the boxes and begin to place the paintings against the wall in the locations we planned … as you may guess, sometimes things just do not look right and we need to rearrange. Then the fun begins --- actually hanging the paintings. The most time consuming part is making sure they are all hanging the same level – we use 62” as the center point. Depending on how many of us are at a particular show and how large the booth is, this process can take between 8 and 12 hours. After the paintings are hanging it is time for the finishing touches … wall cards and signs, adjust the lighting, set-up our tables and finally make sure the floors are vacuumed. When that is all done, our booth is ready for the show. At certain shows, vetting is required. This is a process where groups of exhibitors and, at times, outside experts walk through the show and check the authenticity of every work on display. I have been on many vetting committees and it is a time consuming job. We can now fast forward to pack-out. After they announce the show has closed, it is a race to get everything repacked and into the hands of our trucker. We begin by designating an area in our booth where we will pack, then the paintings in that area are removed from the walls and we set up our empty bins. Now this is actually easier than you might imagine … we can usually have everything done in 2 – 3 hours. I think our record was just over 1 hour – we were exhibiting at a show in Chicago and not only had to make a flight the same night, but had a show in NYC that had to be set-up 2 days later … so the paintings needed to be back in NYC the next day! I am pleased to report that everything and everyone made it back safely! I am sure this does not sound too bad, until I lay out our most recent show schedule. Between the end of January and the middle of February we did a show in Los Angeles (where we had two booths) which ended on a Sunday. The following week our paintings and our bodies needed to be in Palm Beach for a show that opened on Wednesday (10 days later). The Palm Beach show ended a Tuesday and the Naples show opened that Friday (3 days later). Talk about a tight turnaround! There were a lot of plane flights, car rides and packing, unpacking, hanging, packing, unpacking, hanging, etc. I am very pleased to report that sales were exceptional and other than a few typical ‘comments better left unsaid’, conversations were enjoyable. During the Naples show, one individual made a comment which left me speechless. She looked at one of our paintings and stated: “I love this painting, but I do not like the subject matter” … that one stumped me! I am still trying to figure out how you could like the painting and not the subject matter – aren’t our academic works usually about the subject matter? As for the balance of 2016, our tentative show plans are as follows: In April we will be presenting our contemporary show Synesthesia, featuring some amazing works by the Ani Art Academies’. At the end of July, we will return to Newport and by August we will be in Nantucket (our first time) and then we head to Baltimore (another trifecta). In October we have another gallery exhibition featuring 6 award winning artists from the Art Renewal Center. November will find us back in Winnetka and depending on timing; we may do another NY show in November and possibly the December Palm Beach show -- this could be our third trifecta of the year – not sure what you would call that … a trifecta hat trick? If all goes as planned, we will participate in 10 shows outside the gallery and in need of a long vacation! We do hope to see some of you during our travels. Christie’s and Sotheby’s London both featured their Impressionist/ Modern and Post-war/ Contemporary selections early in February. Looking back, figures from the last few sales of the same periods brandished some incredible results so going in, we knew it would be hard to eclipse the recent auction totals. Starting off, we had Christie’s Impressionist & Modern with Max Ernst’s The Stolen Mirror leading the way at £7.6M ($10.9M – Est. £7-10M); a far cry from last year’s Venetian scene by Monet which led the sale at $35M. Taking second was an early work by Egon Schiele which brought £7.25M ($10.4M – Est. £6-8M) followed closely by Marc Chagall’s Les maries de la Tour Eiffel, which found a buyer at £7.02M ($10.1M – Est. £4.8-6.8M). Other pieces headlining the sale were by Miro, Leger, Cezanne, Picasso and Renoir. However, the sale as a whole only totaled £95.9M ($138M – Est. £83.6-123.3M) whereas the same sale in 2015 netted $222M! There were also 22 unsold lots (this resulted in a 75% sell-through rate) in this year’s edition compared to last year’s 10 failures, so across the board, it appears the market is coming down from the record setting numbers we have become so accustomed to seeing. Sotheby’s took a different approach and offered a slim selection of just 53 works in their Impressionist & Modern evening sale. 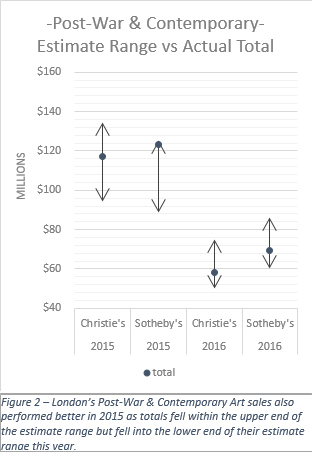 Impressively, Sotheby’s still challenged Christie’s total with about half the amount of material on the block. Leading the way was Picasso’s Tete de femme, painted in 1935, at £18.8M ($27.1M – Est. £16-20M). Works by Monet and Rodin brought £11.5M ($16.62 – Ests. £12-18M and £6-8M) each, good for second. The statistics here tell a similar story… While the sale’s total of £93M is impressive, still 15 of the 53 lots failed to sell which works out to roughly 72% sold. Typically, an evening sale offers the cream of the crop and will see sell through rates of 80-90%. When a sale falls below that, I normally look to the condition and quality of the works being offered to understand the shortcoming; but in this case, something else might be going on. The following week, Sotheby’s was first to take a crack at the Post-War & Contemporary market. Taking the top spot of the evening was Lucian Freud’s Pregnant Girl at £16M ($23.2M – Est. £7-10M). The painting depicts a woman, face turned away with her chest exposed… the work happens to be one of the more beautiful subjects painted by Freud. Interestingly (some may say disturbingly), this subject is actually a portrait of his lover, 17-year old Bernadine Coverly, while she was pregnant with their daughter... Freud was nearly 40 years old at the time and you probably did not know that it is rumored Freud had 40 children, though only 14 have been identified. Alberto Burri’s work Sacco e Rosso found a buyer at £9.1M ($13.1M – Est. £9-12M) which was good for second and nearly doubled the previous auction record for the artist which was set back in February 2014. Following in third was Basquiat’s Untitled (Head of Madman) at £6.2M ($8.9M – Est. £4.5-6.5M). In the end, 78% of the works sold (43/55) which yielded £69.4M ($100.4M), not much more than the low end of the £60-86M presale estimate range. The following evening, Christie’s offered their assortment of Post-War and Contemporary works and the final numbers solidify the big picture. Taking the top spot was Peter Doig’s The Architect’s Home in the Ravine bringing £11.2M ($16.3M) on a £10-15M estimate. Falling well behind in second was Francis Bacon’s Two Figures bringing £5.4M ($7.9M – Est. £5-7M) followed by Lucian Freud’s Head of Esther bringing £4.7M ($6.9M – Est. £2.5-3.5M). Additional works by Doig and Freud, along with Hockney, Calder and Fontana rounded out the top ten lots on the night. I find this offering of works to be the most telling about the art market… Here, almost 90% of the works being offered found a buyer; a very respectable figure. Nevertheless, the sale only brought in £58M with a presale estimate of £50.1-74.8M. When you remove the buyer’s premium from the sale’s total, you realize that across the board the prices being paid for works are at the bottom end of their ranges. This is an anomaly for evening sales as works regularly (or used to regularly) top their estimate ranges. 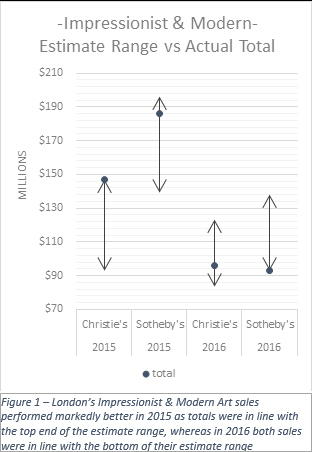 I think what we are experiencing here is a foreseen and reasonable correction in the “record setting” region of the art market. Gallery Updates: As mentioned earlier, we will be exhibiting at the Affordable Art Fair this month. Web Site Updates: Over 40 works of art passed through our hands last month; among them were paintings by Victor Marais-Milton, Edouard Cortes, Louis Aston Knight, John Stobart, Anthony Mastromatteo, Tim Jahn, Todd Casey, Mark Daly, Ben Bauer, Stuart Dunkel, David Palumbo, Ken Salaz, Katie Swatland and Berlyn Gonzales. In addition, a number of new works have been added to our web sites. Next Month: More sale and gallery updates – plus a research update on the Dupré Catalogue Raisonné.